The true test of your heating company’s value! 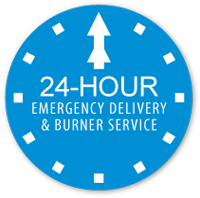 VEO Energy Systems provides 24 hour emergency service to all our customers. In fact, we specialize in it! If you are faced with a heating emergency, our technicians will promptly show up to your home or business and diagnose and repair the problem. Whether it is 8 o’clock in the morning or 3 am on a cold January night, our technicians are prepared to promptly serve your needs. If you need an emergency fuel delivery or you are having problems with your heating system, VEO Energy Systems will respond to your call 24 hours a day, 365 days per year. We even have four wheel drive emergency fuel delivery trucks that can handle a propane or heating oil run out and are stocked with parts for any type of boiler or furnace repair. All VEO technicians are company trained employees who continually receive the most up to date training and certifications in the heating and cooling industry. With today’s modern high efficiency heating systems, our technician’s experience and knowledge are crucial for maintaining, troubleshooting and repairing your equipment. Please call (888) 301-9562 or locally at 794-5511 to request emergency service. Representatives are available 24 hours a day to answer your call. Experience the VEO Energy Systems difference when you put our technicians to work for you!